Seriously you guys. This is exactly like Panera Bread's broccoli soup. It is so thick, rich, creamy, and cheesy. The bread bowl is so crackly on the outside and tender and soft on the inside. It brings a tear to my eye. You know how whenever you walk into a restaurant and you're trying to decide what to order, the first thing you always do is inspect the plates of those who are already happily consuming their meal? And as you swoop from table to table like a vulture, trying to decide what looks best, you're always trying your hardest to resist the urge to faceplant into their perfect piles of mashed potatoes or ravenously demolish their mountains of french fries? 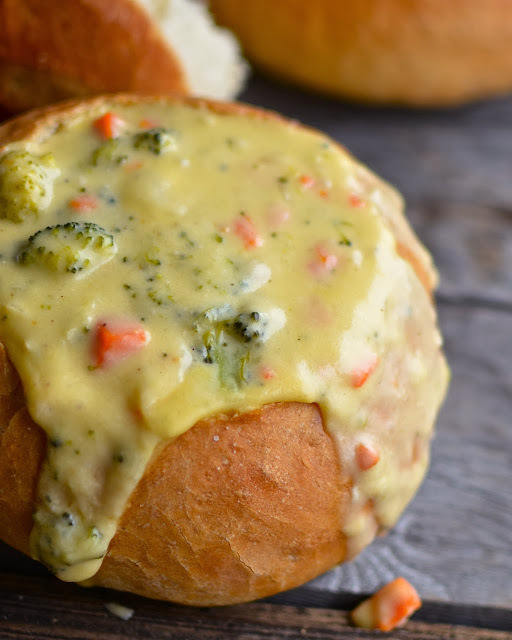 Well, when you do this at Panera Bread, you will discover a very interesting phenomenon: over half of the people are feasting on big, fat, crispy bread bowls filled to overflowing with broccoli cheese soup. Everyone knows that this is obviously the best broccoli soup on the face of the Earth. And now, you can make it at home. Any time you want. And guess what else. IT'S NOT EVEN HARD. Even the bread bowls are easy. You can make them in like an hour. I'm so serious it's not even funny. This soup was especially easy to make because I had a little helper. Cookie was very eager to dump and stir ingredients and eat the extra bits of cheese that my careless hands scattered on the table. Then when I took it away to photograph it (harassed by many angry cries of hunger from my ravenous family, I might add), Cookie decided she was going to prepare a fruit salad. She brought it in so that I could photograph it with the rest of the meal. Isn't it lovely? I'm going to tell you about the bread bowls early next week. I just thought they deserved their own post. Okay, okay. So I actually was just too lazy to edit all the photos of the bread-making process. But you will have bread bowls soon. I promise. I actually made this soup before, only I have modified the recipe since then. And guess what, this version is actually gluten free (really just because I think using corn starch as a thickener is closer to the real thing). Enjoy! Cook the butter, onion, and garlic on about medium heat until tender. Slowly add the half and half and chicken stock. Mix the corn starch with a little bit of water until there are no clumps and add it to the rest. Add the nutmeg and bay leaves and cook on medium low until thickened. Add the carrot and broccoli and simmer until tender. Discard the bay leaves. Add the cheese and stir until melted. Season with salt and pepper and serve in bread bowls. Note: In the old post, I pureed it. You can do that if you want.